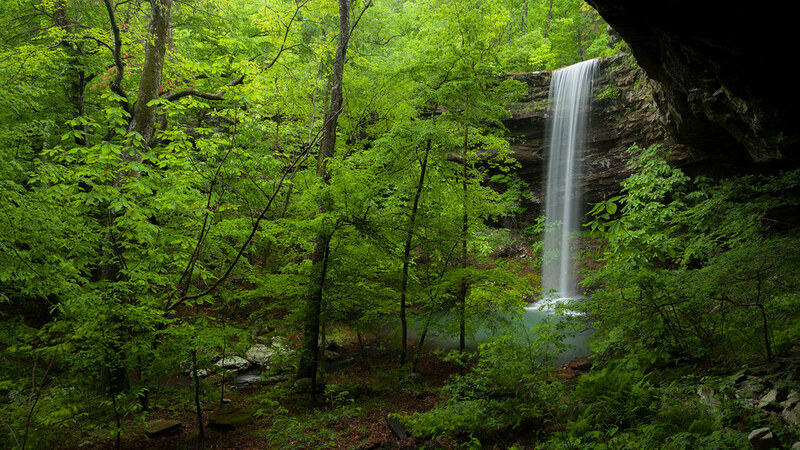 Brian Cormack and I headed to the trail head for one of the most beautiful waterfalls in Arkansas a couple of weekends ago. We arrived somewhat late into the evening and upon arrival were greeted with a slight sprinkle. I knew I had limited time to setup my tent, so jumped out of the vehicle and went to work. Just as I finished setting it up that sprinkle turned into a heavy rain. Brian and I typically will start a small fire and chat into the evening, but not this night. I jumped in my tent and Brian his car and we got some much needed sleep before our hike into Bowers Hollow Falls. It rained the entire night and only eased up just before we awoke at 6:00AM. I remember the hike into Bowers being much more difficult than it was. I can chalk that up to either being much easier than my Punchbowl hike before, or the fact that I have tried to get out every weekend this year to do some photography. It turns out, the trail runs almost level the entire 2 miles to the top of the falls, and only then does it become a little more technical. With all the rainfall we received, the flow at Bowers was absolutely perfect. We honestly couldn’t have asked for better conditions to shoot this amazing waterfall. It was cool well into the morning with a light fog high above our heads which provided some incredible light the entire morning. We spent around 3 hours here photographing every possible angle of Bowers Hollow Falls. If you’re up for a slightly technical hike, I highly recommend Bowers Hollow Falls.